What kind of session is again up to the audience! Johannes Schlueters got it right and gathered with followers in the lobby area when no room was available. Kristian Koehntopp tortuered listeners with a spontaneous drawing on a tissue how to get benchmarking right… Long, long breaks for discussions and a need to become active are part of the game. I must say, I am surprised how well the visitors behaved. The no-show rate on the first day was as little as three percent. This is absolutely amazing. Recall that a flight to Palma can cost you no more than a train trip through your country. Round trip flights to many destinations are around 150-200 Euros. A train ticket from Kiel in the north of Germany, where I live, to Munich in the very south and back is 210-280 Euros. And, #phpuceu sponsor trivago reports 210 euros for a single room over the weekend in Munich, which is an exact match for Palma. At the same costs of the national PHP Unconference Hamburg, I get a weekend vacation in the sun! Still, people showed up on early Sunday morning with a smile in their face. They knew yummy catering (tapas) was on the agenda for lunch. If everbody is relaxed, discussion go smoother. 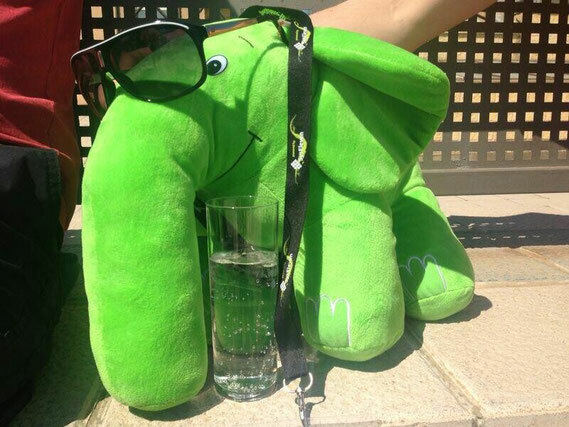 And, exchanging ideas, getting connected is all what it is about: whether you wanted to bother us MySQL folks, ask Zend about the green jumbo elePHPant, hack PHP or squeeze out long term project management consultans… all up to you. Or, how about table soccer to break the ice. Compared with a national unconference, say one in Munich, Palma has more party locations and better drinks to offer. The 1 litre beer monster, which goes stale before it reaches you in an huge umpfda-umpfada hall is available. If you really want that… see the photo. … hiking in the hills, cycling or riding a scooter. Quite some decided it would be a good idea to stay a day longer for some nice time on the island in late spring. This has a very positive effect on the unconference itself. There is less of a rush on sunday. People stay for an additional night and the last session of the day is almost as popular as the first one was. … and the winner got a hug from one of the organizers, after the latter had stopped biting the elePHPant! Something that obviously has irritated the new shepard of the elePHPant. My own elePHPants, well prepared and trained for the trip, became friends with him. However, I think, the big one is not quite such a sports gun as the smaller ones are. This was a wonderful event: work and fun combined! Despite the fun, everybody needs measurable results to justify their investments. Search Twitter, Facebook, Google+ or blog posts for opinions, if you have not participated and want to know if all was green – not just the elePHPant. PHP is missing! Spouses and family welcome !? For next year, it would be perfect if there was a partner happieness program – short PHP. Ideally, it would be run as an unconference. All spouses gather in the morning to propose something and vote about their plans for the day. I would be fine with that as long as they don’t start stealing sponsors, or do photo contests about the best looking new potential partner or the like….